My husband and I celebrated our 5th wedding anniversary a few days ago. Wow! Times has flown right before our eyes. It was a low-key celebration: We went to Olive Garden, and the following day we went to CineBistro for dinner and a movie. We like to keep things simple. I thought it would be nice to share some traditional gifts couples SHOULD give their spouses each year of marriage. 1rst Paper Dave Matthews Band concert tickets…That can count as paper! 3rd Leather Coach Bag ….Definitely counts as leather! Happy Reading and St. Patty’s Day!!! I love the Harry Potter Films….I know what many of you will think while reading this line, and no… I am not too old for Harry Potter. I wish I had read the books, but the films are just so good that I do not feel the need to read them; unlike the Twilight Saga films (Sigh). 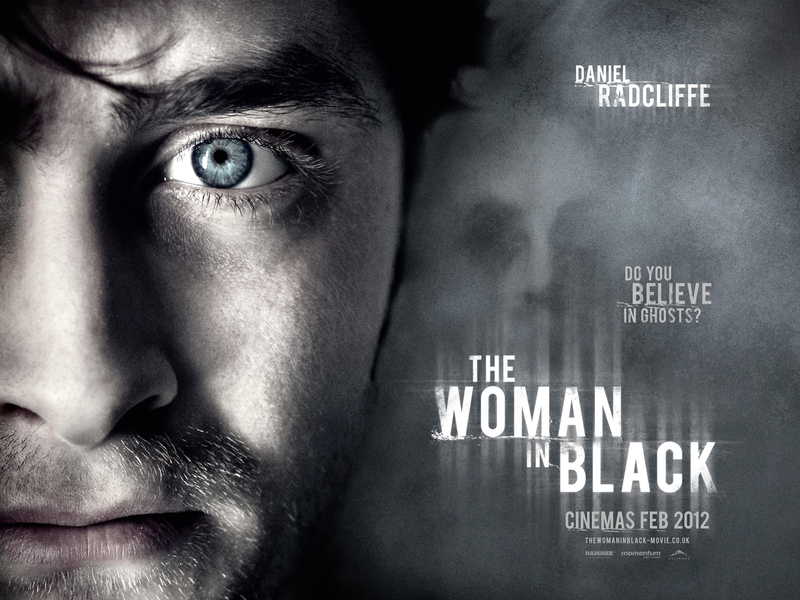 However, my love affair with Mr. Potter was not the reason we decided to go see the movie “The Woman in Black”, starring Daniel Radcliffe. I actually loooove horror films that make me jump, sweat, and squeeze my poor husband’s hand while watching. I love the torture of being frightened. So off we went to CineBistro to get spooked. I must warn you that the film did not get good reviews, but I actually enjoyed it and gave it a 3.5 out of 5 stars. I also must admit that it was difficult to see Mr. Potter Radcliffe in a new role, and I think it threw people off, which is why it got the reviews it did. Also, it was strange to see him play a widower with a son. His face is still very boyish looking and he is not very tall. But besides all the technicalities, the movie was creepy and I loved every minute of it. As you may already know, the film is based on a widower/attorney who goes to a strange, little village, to sort out the mountains of paperwork of a recently deceased heiress. His law career is struggling, due to the debilitating depression he is in from the loss of his wife at childbirth. His own child keeps drawing pictures of his daddy with a very sad face. When he arrives at the village, he is faced with people that are behaving quite bizarre and most of the children in the village are mysteriously dying. As he arrives at the mansion of the deceased woman, he is confronted with unexplained noises and an eerie figure of a woman dressed in black. The lawyer already knows that the house was vacant and no one in the village would dare to go there. So to him, this figure is quite inexplicable. As it turns out, the woman he keeps seeing is a scorned ghost named Jennet, who was very angry at her sister Alice (the deceased heiress). Jennet was accused of being mentally unstable and unable to raise her child. Due to her supposed instability, she is forced to give up her child to her sister Alice, who insists on raising him as her own. Jennet is also forced to live in the house with Alice, her brother-in-law, and her own child, without being able to tell her son that she is his acutal mother. The boy winds up dying in a carriage accident, and Jennet blames her sister and brother-in-law for the accident. Unable to cope with the loss, she winds up hanging herself. Scorned and tormented with grief, her ghost wanders into the village, but if someone sees her presence a child suddenly dies. I was slightly confused while watching this film as to why Jennet was going around the town kiling these poor children. But after thinking about it, I think I know why. When her own son died, she felt robbed out of being a parent and believed that her sister and brother-in-law could have done more to save her child. She was tormented by the fact that her sister and her sister’s husband, and the people in the town for that matter, did not do more to save their own children. Angered by this, she continued to kill and collect the souls of children. I do not agree that you need to go around killing children to prove your point, but at the same time many of the children from the village were killed nearby their parents, and the parents did nothing to save their own children. At the end of the film, Jennet is sort of vindicated when Radcliffe’s character risks his life to save his child’s life. I am not a parent and have no room to talk write about this, but if God blessed me with a child I would take care of him/her to the point of giving up my life. Isn’t that what good parents are supposed to do? To care and watch over their children? Sometimes I see many parents that have children just to conform to societal rules and not because they really wanted to have children. They wander around and ignore their children most of the time. This reality is quite sad, and while I don’t doubt that most parents love their children…are they doing enough to keep them safe from harm? Finally, I would like to compliment CineBistro on an amazing experience. My husband and I had a great time dinning and watching this great thriller. The food was delicious, and it was a first for me to watch a movie while eating dinner at a movie theater. The atmosphere was vibrant and happy. I will have to go back to play at their bowling alley. P.S. Good point made by one of my readers. “Why should I go see this movie after reading this?”….Cause it is freakin awsome!!!! I want to go see it again and you will too!